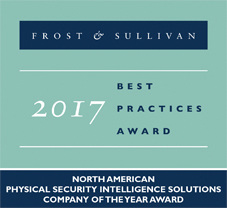 Frost & Sullivan recognizes Verint’s leadership and technical innovation in the emerging physical security intelligence space and success at delivering unique benefits and value to its global customers. The award highlights Verint’s expertise in actionable intelligence and delivery of situational awareness solutions and advanced data analytics that address the mission-critical security needs of today’s organizations. Today’s enterprise-class security teams face significant threats and operational challenges making managing risk and protecting people, property and information Mission-Critical. Verint's comprehensive portfolio of Security Intelligence Solutions help customer solve their largest security challenges today while forging a path to deliver the promise of tomorrow’s Intelligent SOC. Unauthorized use, duplication, or modification of this document in whole or in part without the written consent of Verint Systems Inc. is strictly prohibited. By providing this document, Verint Systems Inc. is not making any representations regarding the correctness or completeness of its contents and reserves the right to alter this document at any time without notice. Features listed in this document are subject to change. Please contact Verint for current product features and specifications. All marks referenced herein with the ® or ™ symbol are registered trademarks or trademarks of Verint Systems Inc. or its subsidiaries. All rights reserved. All other marks are trademarks of their respective owners.